« Collagen Masks and Facials will Amaze you! I am writing this off the cuff because I CAN NOT believe the terrible work that is being pawned off as a lash extension job! I just spoke to another new client that had a bad experience. Lash extensions should be Beautiful, Clean and Natural looking yet what we are seeing is disgusting in some cases and downright dangerous in other cases. We will be posting a video in the future about how lash extensions should be placed, how they should look as far as length goes from lash edge to corner and how they should look when you leave. In the mean time though, here are a couple of stories and some pictures to make my point. To the consumer looking to get lashes for the first time, go and look at some lashes on someone and then look at more. On the net, on your friends on Facebook and more. THEN find a Technician not based on being the cheapest, but based on experience and her portfolio and then make an appointment. I hear some clients getting the cheapest “deal” and only looking at price. That is going to get you into sure trouble! Here is what to look for. I didn’t even really know until I watched someone doing bad lashes once. Her is how that went. I went into this salon where a gal was applying lashes and asked her if I could watch. She said no problem. I was watching her place one lash after another, pretty fast I might add. I was amazed at this and kept watching. She would dip in glue and come out and place. Pretty much as fast as you can read this. I was watching for about 5 minutes all the while something was bugging me but I couldn’t figure out what. I kept watching and watching. To the untrained eye, they didn’t look too bad. THEN IT HIT ME like a ton of bricks because I started to see how the progression of lash placement was starting to look. Pretend that each finger is a lash. Find your big middle knuckle. Now look at that portion of your finger from the edge of the palm to that middle knuckle you located in step 3. Ok, so now picture that whole area, including the spaces, FULL OF GLUE and only the top 2/3rd’s are the free lashes. GROSS! That is hideous! So you have this whole mess of heavy glue at your lash root now that will tear out your lashes as they grow, feel heavy and just downright look ugly. Plus, it’s going to take more work and more damage on your fill. Not to mention you are now open to eye infections. It’s a stinking mess! Plus, I could smell the glue so I knew it was also cheap glue. We use hypoallergenic, hospital grade glue. It’s expensive as heck but it’s a great product. We only give our clients the best because it is what we ourselves would want. The glue is NOT even visible and it is only on the SINGLE lash enhancement on a SINGLE natural lash! You can’t even tell where the glue is. It is invisible IF done correctly. Here is a little horror story that we heard from a new client that had gotten a terrible job like the one above. “I have a client new client. Before seeing her myself for an eyelash extension application she decided to find the cheapest salon around the area to have them applied. Not only did she walk out with her lashes looking like spider legs- having the extensions applied to 4 or more of her own lashes, but days later she developed a serious stye in her eyelid and a resulting infection too! The stye and infection came about due to the unsanitary tools and cheap products that were used on my client plus the glue that was now clogging her own lash pores. This operator had glued the extension lashes half on the SKIN of her lid and half onto the eyelash! The glue was clogging pores and follicles. Not only blocking and clogging them but due to the unsanitary use of tools and products, infecting the area as well. Be careful where and who you let apply your extensions! Thankfully this horrid experience did not scar my client for life and she decided to try for a second time. Theses types of stories happen all of the time. The above story is not rare. There are many technicians that do an amazing job and they do it for a reasonable, fair cost. It is a time consuming and tedious job that requires training. We have these experienced professionals here at Beautiful Skin and Nails. The tech that told the above story has been doing lashes for almost 10 years! She is meticulous and does beautiful, natural work. This is one of our models. You have many options for the type of look you want. You can go more natural where a few less lashes are placed and maybe they will be a touch shorter for a sporty look if that is what you want. 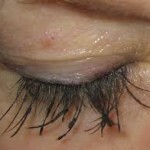 Or you can go for the all out Extreme Lash look where tons of lashes are placed and you can have them longer as well. Or choose something in between. We can help you to make a decision when you come in after you chat with your service provider. She will help you with your options based also on your own lashes. Remember- we don’t want to destroy your own lashes in this process. If you have a very thin lash, you will choose differently than the person whose lashes are super thick and sturdy. That lash can tolerate more stress. I hope this has helped educate you a little and made you feel more confident when choosing a lash tech. I’m lucky to have the techs I have. You will get Beautiful Natural lash extensions here at Beautiful Skin and Nails! Here is another one of our models. She wanted a super natural look. Beautiful. See more on our website at beautifulskinandnails.com or on Facebook. The best compliment for us would be a referral to your friends and family. We will be happy to provide them with the excellent service provided to you. We would also appreciate reviews, likes and shares of our business page.